To explore the relationship between demographics and political participation, we estimated a weighted, Poisson mixed-effects model with random intercepts by country and robust standard errors using the Stata program gllamm for estimating generalized linear latent and mixed models. Alongside this pooled model, we evaluated the robustness of the results by estimating the models for each country separately. These country-specific models yielded similar conclusions. Overall, we find that education has a strong positive influence on individual political engagement. A person with a secondary degree or higher has a predicted political participation of 1.23 on a 0 to 10 scale. A person with less than a secondary education has a predicted participation of 1.05 – a difference of 0.18 political activities. 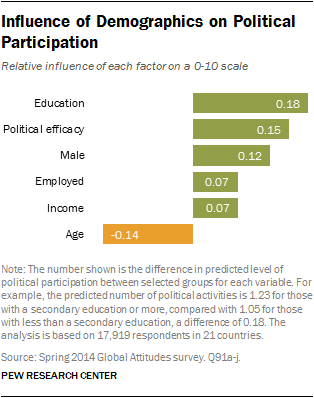 In addition to education, having high political efficacy (+0.15), being male (+0.12) or employed (+0.07), and having a higher income (+0.07) all have a significant, positive impact on political participation. Age also has a significant influence on political participation, controlling for other demographics. Older people have a lower level of political participation on the scale than their younger counterparts. For example, an 18 year old has a predicted political participation score of 1.28, compared with a 78 year old who has a predicted participation of 1.14 activities (-0.14). The dependent variable is political participation, measured using a ten-item additive scale ranging from 0 to 10, with “10” representing people who say they have participated in all 10 activities asked about – the highest level of political participation. To create the scale, for each activity, respondents were coded as “1” if they say they have ever done the particular political activity; “.5” if they say they have not done, but might do the particular political activity; and “0” if they say they have not and would never do the particular political activity. The independent or predictor variables for education, gender, employment and income were recoded as dummy variables, where 1 means secondary education or higher, male, employed and income at or above the approximate median. Political efficacy is coded where 1 means the respondent says government officials care what people think, -1 means officials do not care and 0 means neither care nor do not care. Age is treated as a continuous variable, ranging from 18 to 97. All independent variables are significant at the p < .05 level. Skrondal, Anders and Sophia Rabe-Hesketh. “Multilevel logistic regression for polytomous data and rankings.” Psychometrika 68.2 (2003b): 267-287.